Beautiful, talented lingerie designer Lina Cornaro sits on the cusp of major success. After her fiery affair with tough Formula One driver Ivo Zanardi ended in heartbreak, she’s learned to keep her focus on her career. Nothing could make her return to Ivo. Nothing, except the public revelation of her darkest secret: Lina is the illegitimate daughter of Sarcaccia’s King Carlo, one of the most famous men in the world. When paparazzi trap Lina outside the most important meeting of her career, Ivo arrives to rescue her from the horde. She has no choice but to escape on his arm. But can she trust her career to the driven, charismatic man who once left her devastated? Or is he racing for a new prize—her love? 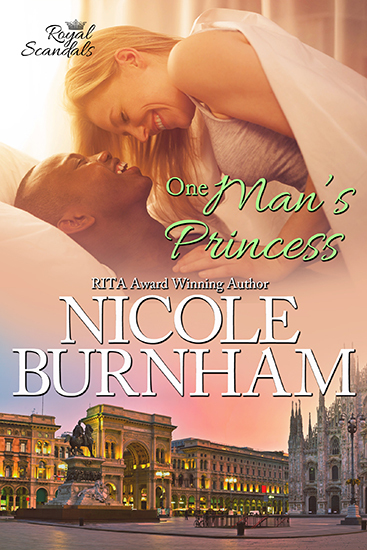 Nicole's newsletter is the place to learn about special deals, giveaways, and upcoming releases, events, and appearances. As a thank you for joining, you’ll receive a FREE copy of A Royal Scandals Wedding, a novella that goes behind the scenes of Sarcaccia’s first royal wedding in a generation. More giveaways and special opportunities will be available in the future, so stay tuned! Once you subscribe, you'll receive an email with the link to your FREE novella! Thanks so much for joining the newsletter list!